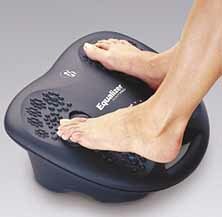 EQ-400 Equalizer Human Touch FootPro Foot Personal Massager -Twin, custom-designed “Ergo-Pad” massage heads for deep percussion massage, Scientically-located Acupressure nodes stimulate ALL of your feet’s pressure points at once, Powerful four-speed motor with automated “program” mode, With speeds ranging from 1900 to 2600 percussions per minute, the EQ-400 delivers the most stimulating massage available. Integrated handle for easy portability. With speeds ranging from 1900 to 2600 percussions per minute, the EQ-400 delivers the most stimulating massage available. Shipping: Standard Continental USA Ground Shipping is INCLUDED on NEW EQ-400s. 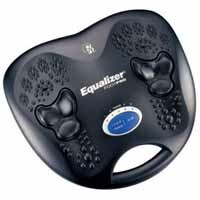 NEW EQ-400 Equalizer Massagers include a 90 Day Factory Limited Warranty. 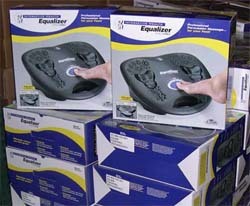 Reconditioned EQ-400 Equalizer Massagers include a 30 Day Factory Limited Warranty.